THE GOLDEN VOYAGE OF SINBAD is both an outstanding Peplum and the best film ever made on the Sinbad theme. 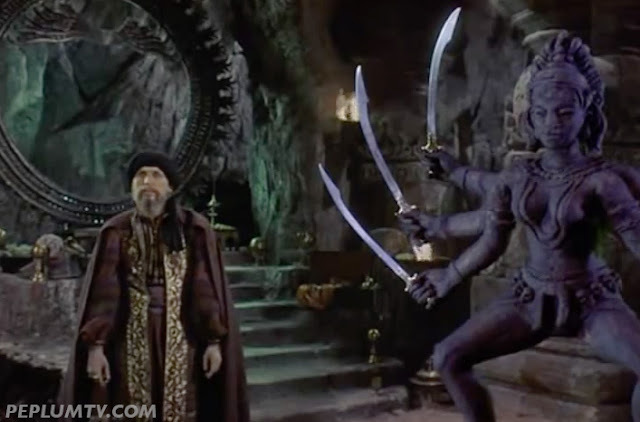 SINBAD AND THE EYE OF THE TIGER is the third and final Sinbad movie that Ray Harryhausen made at Columbia Pictures. It is distinctly inferior to both of its two predecessors. Subsequent Sinbad themed films by others have mostly been disappointing, at least in my view. Political sensitivities regarding negative stereotypes of Arabs (harems, slave markets, evil sorcerers) mean that the whole Arabian Nights fantasy genre is now pretty much dead. Other dead genres are pirate and western flicks. I totally agree with Scott that the Arabian Nights fantasy is now a dead film genre, and I really pity that. It's not just that depicting ancient Persia includes the various negatives stated above, having non-Arabs play Arabs is now a huge no-no. I'm really surprised "Prince of Persia" got away with it. Personally I'm not offended by any of it. I heard an interview with Tom Baker talking about his experience with "Golden Voyage of Sinbad." His character, Koura the magician, wakes up the Kali statue by throwing a vial of potion on it. This scene was planned to shoot on a Saturday, and all the crew and all the actors were very weary after a long week's arduous shooting, and none was too happy having to show up again on that Saturday morning. The way the shoot was planned, several glass vials had been prepared and a clean-up crew was standing by to re-dress the set after each attempt to hit the statue by Baker. In other words, it seemed everyone was in for a long, boring day. However, the cameras rolled, Baker said his lines, threw the vial and hit the statue prop smack in the head, making the glass vial explode in a cloud of white vapors. The director yelled "cut", and said, "That's it! We've got it! We can't better that." Everyone cheered, taking the rest of the weekend off, and Baker was the hero of the day. On a personal note that nobody cares about, the line Baker says is "you shall pay me obescience!". I was just a young teenager at the time and that was the very first time I had ever heard the word obescience spoken. Baker was so powerfully evil that I had to find out about the word and what it meant, and it became one of my favorite words. It still is. I obviously didn't learn how to spell it and spell-check didn't pick it up. But I believe stories set before Islam could still be made. The whole thing with Allah and such is a big no no these days but Arabian or Persian cultures existed for thousands of years before the advent of Islam. It would be a valuable new take to see an Arab or Middle Eastern cast take this on as that's where it comes from. There have already been so many other iterations of it from other eyes. I had a vague idea Tom Baker did this before Doctor Who, but I had no idea it was so significant. This film role was the catalyst for Baker being cast as the Doctor. When the Doctor Who production team were recommended to consider Baker, they basically went across the street from their offices to a cinema showing "The Golden Voyage of Sinbad" to have a look at him. What they saw from Baker's performance convinced them that he was their man, and the decision to cast him as the Doctor was sealed that same day. And, as we know, Baker stayed with that role for the next seven years.